Taipei, March 8 (CNA) Taiwan has decided to cancel the quota limit for women serving in the military, as part of efforts to recruit more female soldiers, President Ma Ying-jeou said Friday. Speaking at a press conference to mark International Women's Day, Ma said the Ministry of National Defense will cancel the current quota of 8 percent for females. Currently, women comprise 7.6 percent of the total military personnel in Taiwan. Taking France and the United States as examples, women make up over 14 percent of the military in those two countries and have a variety of positions, including administrative work and combat roles, Ma said. The traditional perception, which suggests that only men should serve in frontline positions, is changing, as in many cases, female soldiers outperform their male counterparts even in physical ability, he said. Ma also said during the conference, which encouraged women to purse their dreams, that he will work on improving Taiwanese women's social status and eliminating gender discrimination. In terms of gender equality, Taiwan ranks fourth among 146 countries in the world, behind Sweden, the Netherlands and Denmark, Ma said, citing the gender inequality index published by the U.N. Development Programme. 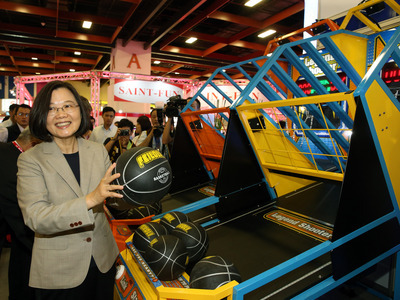 He noted that women accounted for 50.19 percent of all employed persons in Taiwan in 2012, an increase from 46.02 percent in 2000. Among the country's 113 lawmakers, women account for 33.6 percent, the highest in all Asian parliaments, he added. Over half of Taiwan's population of 23 million are females and women play important roles in society, Ma said. Chen Shu-chu, a vegetable vendor and philanthropist from Taitung in eastern Taiwan, who was selected as one of Time magazine's 100 people of the year in 2010, and Cher Wang, chairwoman of Taiwan-based HTC Corp., are two great examples of women who show Taiwan's soft power to the world, he added.